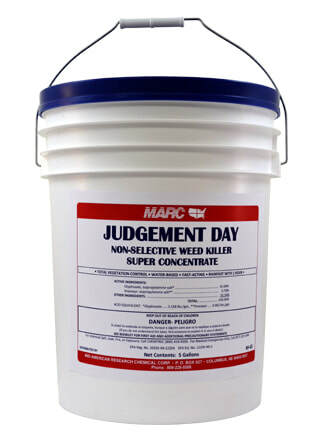 Judgement Day is a fast-acting water-based liquid for total vegetation control. It kills weeds and their germinating seeds, and prevents vegetation growth for up to one year. It works in two ways - as a pre-emergent and as a post-emergent plant control. Judgement Day kills weeds and grasses, roots and all. It is rain-fast within one hour, and does not require rainfall to activate it. It is EPA-registered.